PCI Express Multi-function card, 32 channel (single-ended or 16 differential), 12-bit Low Gain card for up to 44ks/s total sampling rate. 16 Digital Input & 16 Digital Output channels. Internal/external trigger. PCI Express Multi-function card, 32 channel (single-ended or 16 differential), 12-bit Low Gain card for up to 44ks/s total sampling rate. 16 Digital Input & 16 Digital Output channels. 1k FIFO Buffer. Internal/external trigger. 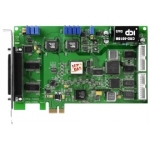 PCI Express Multi-function Card featuring 32 single-ended/16 differential (12-bit) Analogue input channels, 2 Analogue Output (12-bit) channels plus 16 digital input and 16 digital output channels. Low Gain capable of max. 110ks/s. PCI Express Multi-function Card featuring 32 single-ended/16 differential (12-bit) Analogue input channels, 2 Analogue Output (12-bit) channels plus 16 digital input and 16 digital output channels. High Gain capable of max. 44ks/s.